Are you thinking of buying a Kindle Oasis? Do you already have one and want to hear what other’s think? Well you’ve come to the right place! The other Bookish Ladies and I haven’t gotten our hands on an Oasis yet, so we turned to our good friend Karen at New Books, New Love for an in depth review. 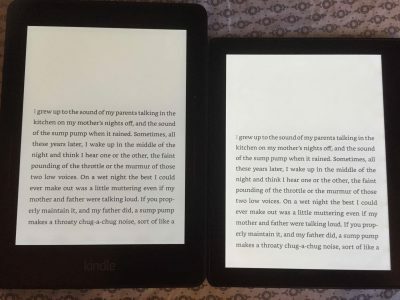 Before we get to Karen’s thoughts though, here’s a quick look at the Oasis’ specs as compared to the other Kindle e-readers currently available (graphic from Amazon). And now what you’ve been waiting for…Karen’s review of the new Kindle Oasis! With that in mind, I’ll evaluate the Kindle Oasis primarily by comparing it to Amazon’s previous Kindle model, the Voyage. I’ve been using the Voyage since it first came out two years ago. Since most people are still sitting on the fence about the Voyage, I’ll explain why I love the Voyage so much more than the bestselling Paperwhite. Even though the most distinguished differences between the Paperwhite and the Voyage are the page-press buttons on either side of the Voyage and the increased clarity/brightness, my favorite feature has always been the beautifully crafted, one-piece, sleek, smooth edge-to-edge glass. The slimness allows reading on the Voyage without a cover an immense pleasure. After reading on the Voyage for a while, the plastic raised bezel on the older Kindles is an eye sore to anyone’s reading experience. With its $289 price tag ($90 more than the Voyage), Oasis comes with a leather cover. The reason behind it I’ll explain a little later. As with all newer Kindles, a USB charging cable is included but no wall plug. The Oasis is so, so much lighter than the Voyage. Comparing them side-by-side on my two hands make me realize that my Voyage is now a brick. However, the cover does add back a little weight if you are planning to read yours in its cover. When I received the Voyage, I thought it was the sleekest design in the world (the glass, remember?) However, as someone who often reads lying down in bed holding the sleek Voyage on one hand, I quickly realized a problem. Since the Voyage has no physical page-turn buttons, turning pages requires me to press down on the half-inch rim of the sleek glass on the right spot, which sometimes, depending on how hard I press or where I rest my finger, causes the Voyage to tumble down and hit my face. The design team at Amazon solved this problem with the Oasis. The Oasis is much squarer in design than the previous Kindles. It’s also asymmetrical. 2/3 of the Oasis is extremely thin, at only a third of an inch. It houses the reading glass (shall I say it? Almost as thin as a book page!) The other 1/3 (the handgrip) is a bit thicker that hold the page turn buttons and the battery. It tapered into the thin end. The way the Oasis is designed is that when you hold the Oasis with your hand, the heavier weight on the handgrip and a ridge help you balance the Oasis comfortably, stably, and always glass side up on your palm. While holding the Oasis with one hand, your thumb also happens to be right on the page turn buttons. The design has improved vastly, ergonomically-speaking. I now can hold my Oasis with one hand and turn pages effortlessly. Compared to the Voyage, which I needed to balance carefully so not to flop it over while turning the pages, this is a huge advantage for me. This is definitely the best feature of the Oasis. The on/off button and USB port now are both on the top of the thicker side of the Oasis if you are holding it with your right hand. The brightness of the Oasis has improved, Amazon added 4 more LEDs to the 6 of the Voyage. The page illumination stays pretty consistent all over the screen with the same brightness as I read through 3 books on the Oasis. However, for those of you who uses the auto-brightness on the Voyage. Amazon has eliminated the light sensor on the Oasis. As I stated above, the Oasis took on a more square design so the screen appears much bigger than the older Kindles, but according to Amazon, it’s just an optical illusion. I do love this illusion regardless. Although resolution remains the same at 300 ppi as the Voyage, I do notice that the Oasis page is much crispier and cleaner, probably due to the increased light. The light adjustment from low to high is also very smooth. There’s no sudden jump from darkness to brightness as the Voyage. The screen also has accelerometer, which means that even though the page turn buttons are only on one side of the asymmetrical Oasis, you can easily flip the Oasis from one hand to another, and the screen will rotate itself. I have shoulder pain so I switch my Kindle from one hand to another quite often. Although I love the auto screen rotation, I find that this is the hardest change for me to get used to from the Voyage, which has buttons on both sides. I’m not one of the few who hate turning pages on the touch screen and absolutely need buttons to turn pages on my digital books. I use both ways equally. With my Voyage, I use touch during the day when I have two hands and the page turn buttons during the night while I’m lying in bed and hold my Kindle with one hand. Oasis has improved page-turn design. It has two thin and narrow physical page-turn buttons on the handgrip. The button worshippers will rejoice over this change! The raised buttons allow the reader to turn the page effortlessly, even in complete darkness. I haven’t had the Oasis falling on my face yet as of this writing. Thank goodness. I love the effortless page turning. I hardly have to move my hand or thumb due to the perfect design of the Oasis. I find that I’m using the page-turn buttons constantly although, as I mentioned, I’m a touch screen reader. The accelerometer allows the Oasis to be held either on the right or the left hand. The default functions of the buttons are page back for the bottom button and page forward for the top. I have a small hand so I adjusted for the bottom button to be my page forward and it works perfectly for me. For those of you who read in a landscape mode: the page turn buttons do work in the landscape mode. However, in my opinion – the landscape mode does not allow the Oasis’ wonderful ergonomic design to be used most effectively. If you have to read in the landscape mode and only wants to use one hand, I find that having the handgrip on the top works better. The price of the Oasis already includes a leather cover. The reason for this is that since Amazon has vastly reduced the weight and the thinness of the Oasis, the Oasis itself will only last about a week to two depending on how much one uses it. However, Amazon remedied this problem by giving it a chargeable leather cover with its own battery. The cover comes in three different colors: black, merlot and walnut. The cover feels soft and expensive, with a felt covered side for the screen. Another of my favorite designs of the Oasis (apart from the ergonomic grip) is how the cover and the Kindle snap together magnetically and perfectly. When you put the Oasis back to its cover, it automatically recharges from the cover. The cover extends the battery of the Oasis from weeks to months. I’m always on the go or traveling. Having a Kindle with extended battery life give me peace of mind. When plugged in, the Oasis and the cover charge simultaneously from the same source. 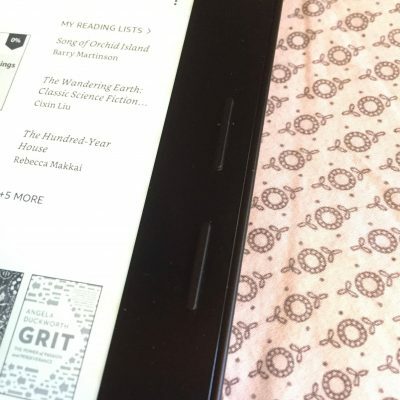 Oasis is the first Kindle to have a battery indicator (in %) for both the Kindle and its cover, and I find it very useful. It’s also the first to have a hibernation mode to save power when the Kindle is inactive, extending the battery life even more. Most older Kindle models have a much shorter battery life. Lots of reviewers complain about Amazon not making the Oasis available without the cover to reduce the price…but knowing that a solar-powered cover is in the horizon, the snapping mechanism and a cover with its own battery make lots of sense to me. Oasis has the same software as the Voyage, but the Oasis has a new reading font. It’s a sans serif with the name of Amazon Amber. As a sans serif fan, I find myself using the Amber quite a lot although Bookerly is still my most used font. The price I paid for my first Kindle 8 years ago was $399. If you read about 2 hours a day. Your Oasis will come up to be $0.007 per minutes and $0.04 per hour of reading in your first year. If you plan to keep your Oasis for 2 years, further divide the figures by 2. My Voyage is almost two years old and is still being used daily. So even if the Oasis is not the Kindle that you need, it’s definitely the one that you want… Making the plunge to purchase the Oasis will depend on how happy you are with the page turn buttons on the Voyage, its design, and how much money you have lying around. For those with a Paperwhite and/or those who appreciate sleek designs, the Oasis is definitely worth the upgrade. Thank you for joining us, Karen! If you’d like to hear more from Karen you can find her at New Books, New Love on Facebook.